The North Cotswold Freecycle Group was set up in September 2006 and is a branch of an incredibly fast-growing International Freecycle movement, which began in Tucson, Arizona, USA on 1st May 2003. The North Cotswold group now boasts over 1500 members and is growing daily. The Freecycle Network - "changing the world one gift at a time" - is made up of 4628 groups with over 6 million members across the globe. Their mission is "to build a worldwide gifting movement that reduces waste, saves precious resources & eases the burden on our landfills while enabling our members to benefit from the strength of a larger community." It is a grassroots and entirely non-profit movement of people who are giving ( and getting) items for free in their own areas. It is all about re-use and keeping good items out of landfill sites. Each local group is moderated/owned by a local un-paid volunteer. Membership is free. The first UK Freecycle Group was set up in London in October 2003 and there are now 486 groups with over 1.5 million members across the UK. Freecycle UK is a Registered Charity in the UK - No. 1118148. 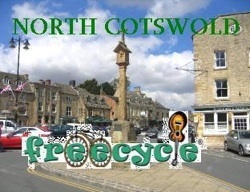 The North Cotswold Freecycle Group covers Chipping Campden, Moreton-in-Marsh, Stow-on-the-Wold, Bourton-on-the-Water, Northleach, Cirencester and the surrounding villages. The Group is open to all who want to "recycle" that something rather than throw it away. Whether it's a chair, a fax machine or an old door, members can feel free to post in on the site. Or maybe they are looking to acquire something themselves. Nonprofit groups are also welcome to join in too! One main rule: everything posted must be free. It is estimated that the Freecycle network helps to divert 100 tonnes of waste from landfill sites every day. Submitted by Andrew Carpenter on Sun, 23/11/2008 - 09:52. Great to see our local Freecycle group covered in the media. Submitted by Freecycle Newswire &raquo; Cotswold Chatterblog: The North C on Sun, 30/11/2008 - 23:28.